Bad news sells, the important thing to remember is fear can hold you back for years and fear is caused by a lack of knowledge. Education and experience can certainly cure fear. Getting the right advice is another important factor of being able to move forward and succeed. the fear inducing headlines and stories. Remember Don't sweat the small stuff. Filled with advice and simple tips, it will quickly show you how to not be affected by the media. 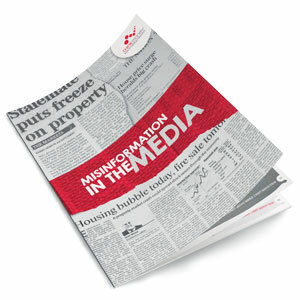 Download Misinformation in the Media now! Think Money provides investors with education and personalised training and support to help create substantial wealth through property investment. If you are serious about reducing debt, creating wealth and setting up your future for retirement, contact us today. We know it will change your life for the better.